Once the dead start coming back to life, it’s discovered that if you eat them, you won’t become one of them when you die. The drawback to this is that you can become addicted if you eat too much, and you will do everything you can to get your fix of dead meat rather than real food. Regular food is at a premium, and Paco’s family can’t really afford much. When Paco begs his dad to bring dead meat home (which is a delicacy), his father can only bring home a corpse that has been dead too long. This kills his family and Paco thinks he is all alone. Until his dead sister talks to him. Somehow she is special, and could be the key to solving the world’s crisis. They venture out to the city, where Paco wants to find a doctor for Sophia. Instead he and his sister realize they are the only children in the city, and are preyed on by men who work for Ted Fleet, a procurer and distributor of illegal dead meat, as well as a maker of snuff films. Calico is a ruthless killer who works for Fleet. He has kept his dead daughter, Beauty, by his side, and hopes that Sophia can somehow cure Beauty, make her become human again. But first he has to protect her from Fleet and the plans Fleet has for the dead girl. Addicted to the Dead crosses the boundaries of the usual zombie stories, taking them to an extreme like no other author has. In this world, eating the dead is the norm. There’s no real fear of the dead here. They are preyed upon by the living, leaving the reader to decide for himself who the real monsters are. Shane McKenzie doesn’t hold back – if you love extreme, grotesque horror, you’re going to love this. What’s great about Shane is that he can write this horrific stuff, yet tell a fantastic story. 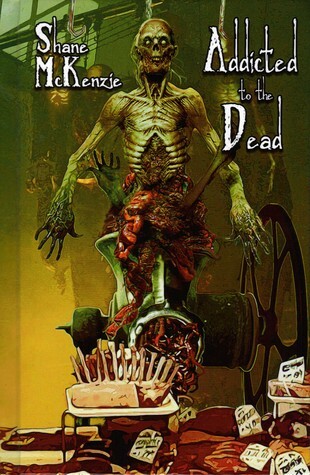 It’s not just a gorefest, it’s a real story, and it keeps you enthralled until the end. There is a bonus short story at the end called “Knock His Teeth Out For Me,” that is part of this world, and it’s a great read on its own. Another strong offering from Shane McKenzie, and I know it won’t be the last – he’s a force to be reckoned with.